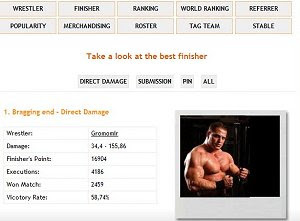 The Wrestling Game is a browser-based game for fans of this sport. The player starts as an inexperienced wrestler who wants to make it big in the world of wrestling. Fight other players to earn experience and money, train hard and take your game to the next level. Learn new moves and improve your skills to be able to defeat the wrestling champions.